Cavatelli has to be my all time favorite macaroni. If I had to choose a last meal it would include Cavatelli with my mother’s tomato sauce with meatballs and Gudinna (rolled up pig’s skin made like a braciole). Vitamia & Sons Ravioli Company is a local pasta maker from Lodi, New Jersey. They distribute to my local grocery store. Cavatelli is made with durum wheat flour, fresh ricotta and eggs. 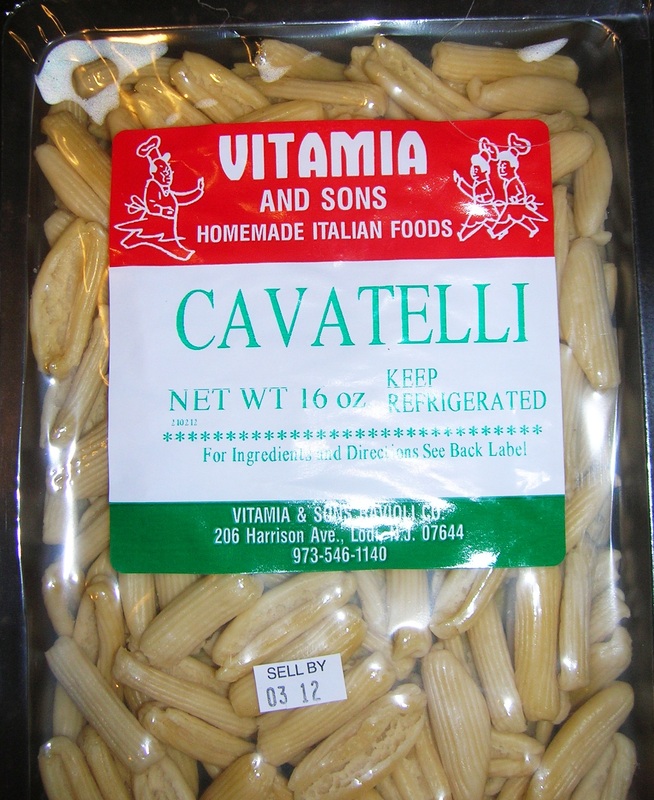 If you can buy fresh cavatelli all the better. If you are lucky enough to live near an Italian specialty pasta store you can get all the fresh ravioli and cavatelli you want. If you’re not that lucky, sometimes these specialty stores ship to your local supermarkets. If your supermarket has a fresh pasta case, go for that. The other alternative is to look in your frozen food section of the supermarket. You can usually find the cavatelli with the frozen ravioli. And then there is the internet. You can get anything you want online. This recipe utilizes all the wonderful Sicilian flavors I grew up enjoying. 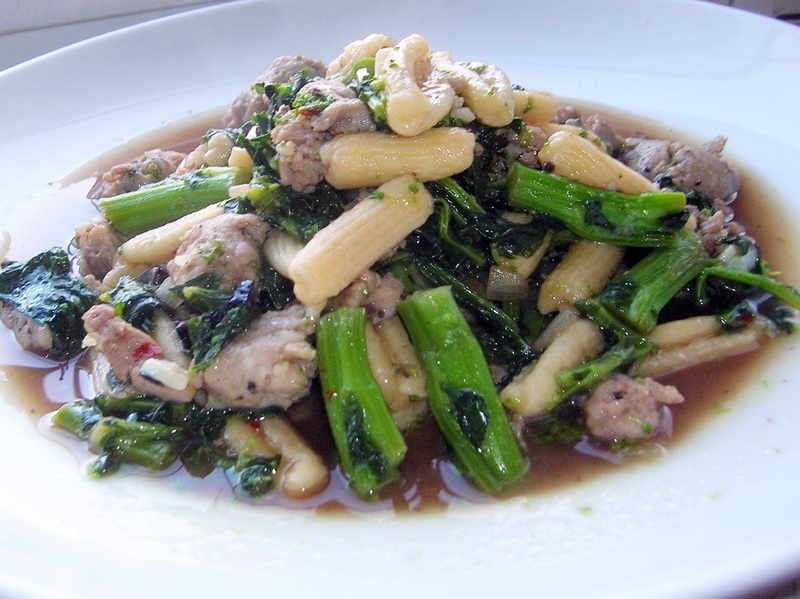 Broccoli Rabe and Italian Sausage with oil cured olives is a dish unto itself. With a loaf of Italian bread, it’s a tasty meal. 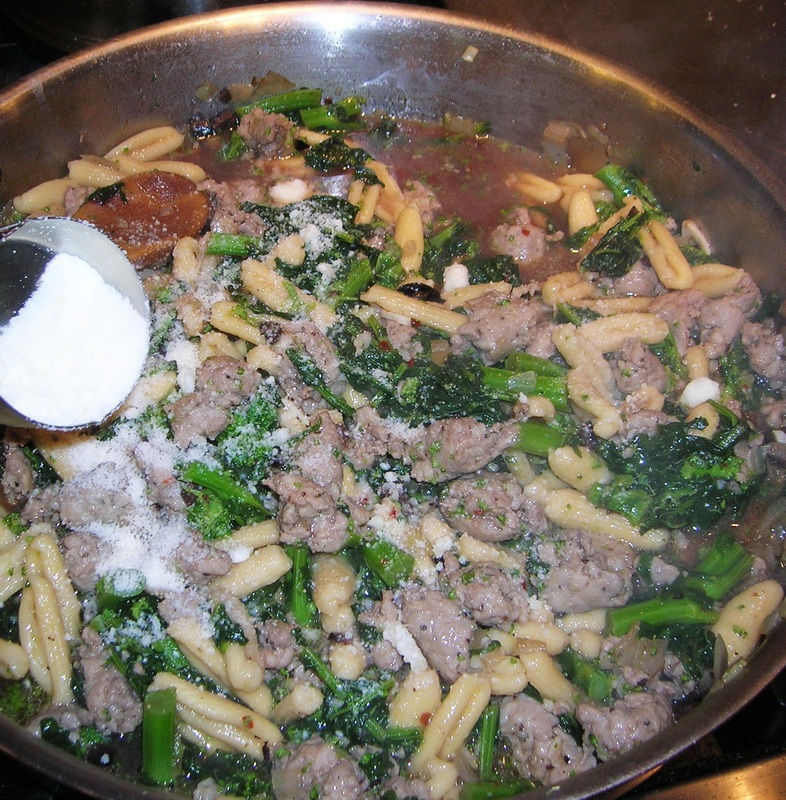 Use those ingredients as a base for the sauce with cavatelli and you think you had died and went to heaven. This very tasty dish is easy to make and hard to put down. Make sure you make enough for everyone! Cut off about 2 inches at the end of the broccoli rabe bunch and discard them. Cut the rest of the broccoli rabe into 1 inch pieces and rinse in cold water. 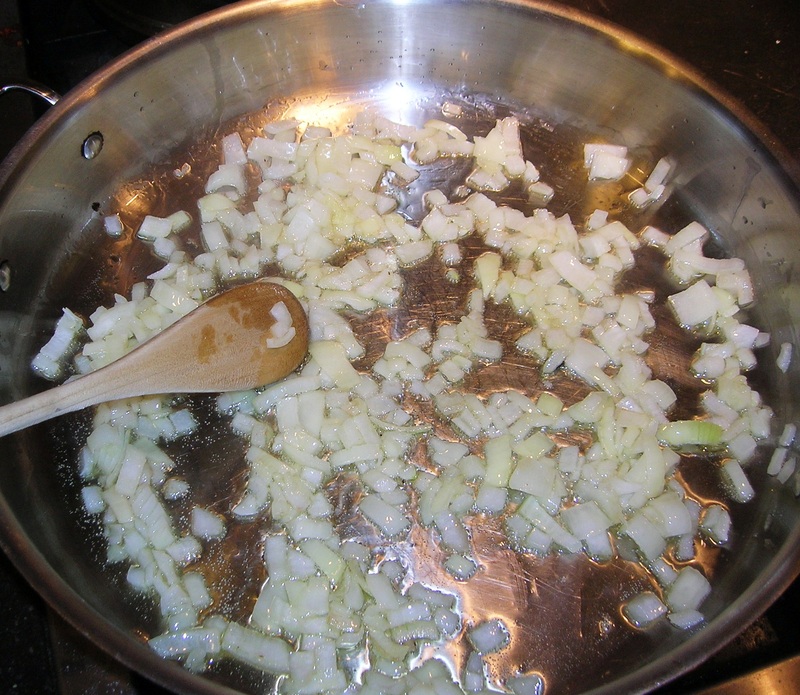 In a large saute pan, heat two tablespoons of olive oil over medium heat. Cook the onion till they get soft, about 3 minutes. Add the garlic and cook for 1 minute. 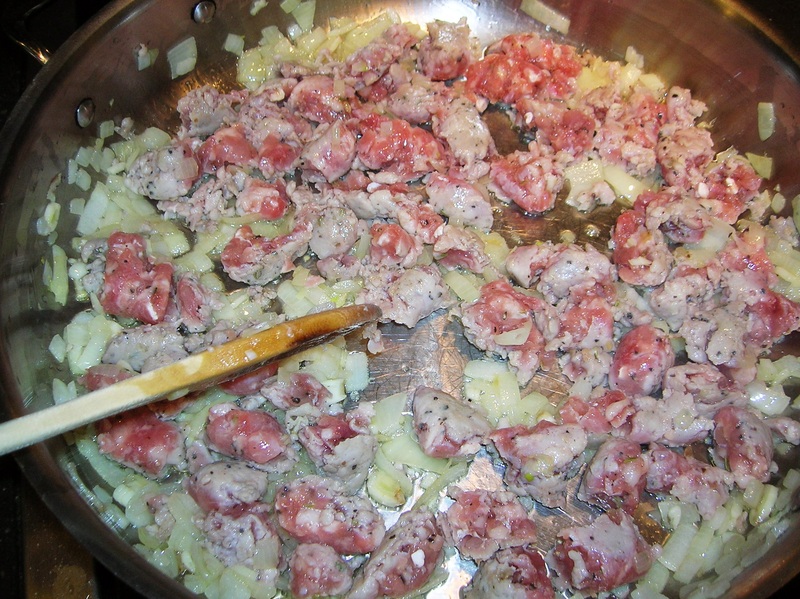 Break up the Italian sausage and add to the pan, stirring and breaking up into 1 inch pieces. Once the sausage meat is cooked, add the olives and a splash of white wine. Cook down till the wine evaporates, about 30 seconds. Add the chicken base and 2 cups of water. 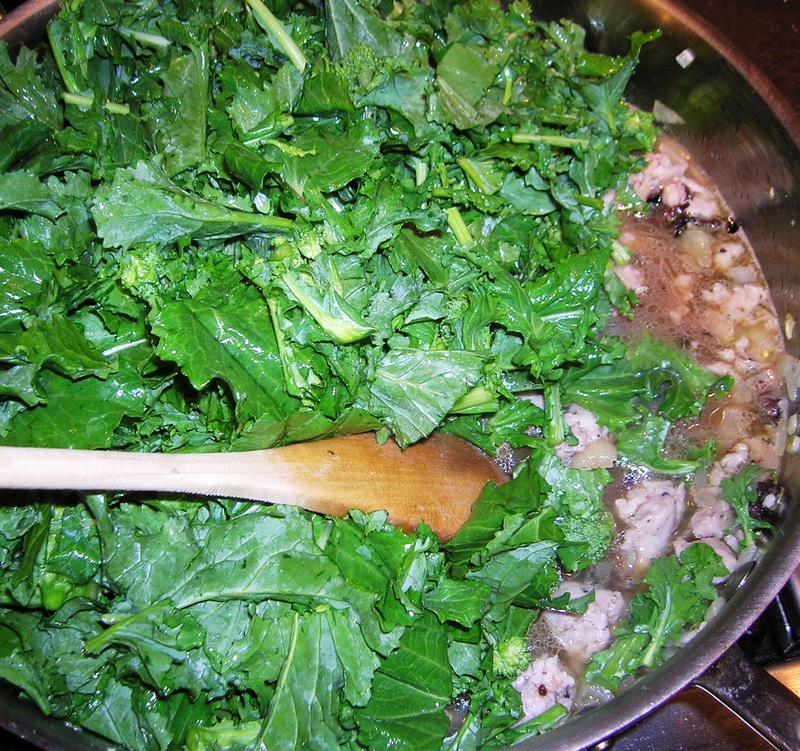 When the liquid starts to simmer add the broccoli rabe. Stir well and cook covered for about 7 minutes. Taste for salt and pepper and add the red pepper flakes. In the meantime cook the cavatelli in plenty of salted boiling water for only 6 minutes. Drain the cavatelli and add to the sauce. Toss to coat everything. Turn off the heat and cover the cavatelli and sauce and allow to sit for 3 additional minutes. Add a 1/4 cup of grated Pecorino Romano Cheese and toss. 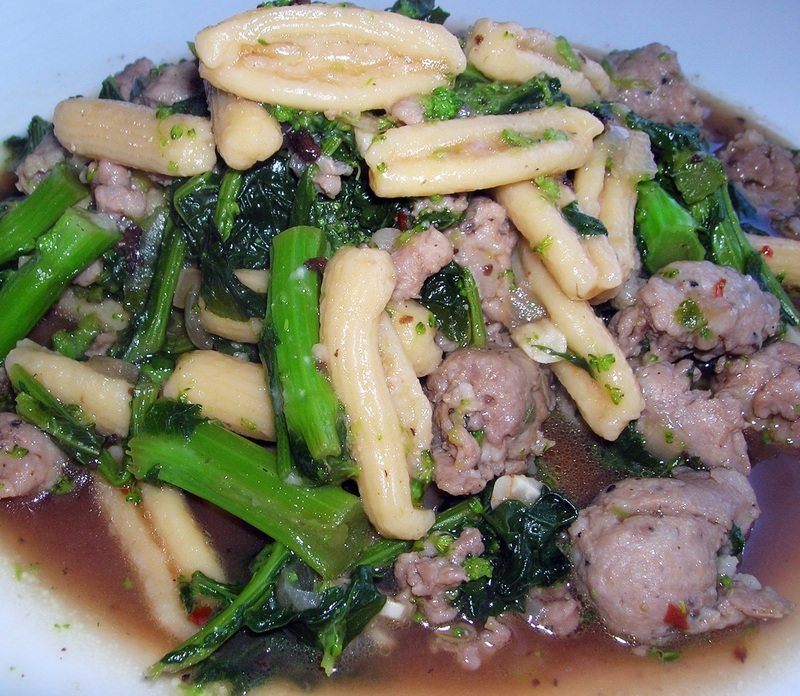 This entry was posted in Pasta, Pork, vegetable and tagged broccoli rabe, cavatelli with broccoli rabe and Italian sausage. Bookmark the permalink. Can’t wait to make this. I’ve had this with bow ties…. and that was good too. Gudinna…. my favorite too… done exactly the same way. BUT… living up here in Maine… that is not around. I drool when I hear Pig’s skins mentioned. I had forgotten the Italian word for it. My mother used to make the same dinner… and we all drooled. She also added sausages to the sauce. A great tossed salad… with virgin olive oli… romaine… Italian bread…. and we stuffed our faces. Now to make this recipe……….. and enjoy and enjoy. Thanks for bringing this recipe to my attention. Happy cooking… and eating of course… that too. Oh God . …. Pig’s skins ! ! ! ! Louise, making this with cavatelli brings it to a whole new level. Hope you enjoy it! Marianna, you might just have to make your own cavatelli! Do you have a recipe for homemade Cavatelli?